After the exciting Gemini experiments, it took no less than 14 years before anyone tried to fly tether technology in space again, and on a much more modest scale. Having been associated with the glory of pioneering crewed spaceflight, now it was back to obscurity for tether technology; the experiments of the early 1980s were all flown onboard suborbital sounding rockets. The first two were launched in 1980 and 1981 as part of a joint program involving the Institute of Space and Astronautical Science (ISAS) in Japan and the Center for Atmospheric and Space Science of Utah State University in the United States. The project was named the Tethered Payload Experiment (TPE), and it used two Japanese rockets of different types: the Kappa 9M (flight K-9M-69) for the first mission and the S-520 (flight S-520-2) for the second. Both rockets were not built to go into orbit, but were just sufficiently powerful to reach very high altitudes and then fall back to Earth. During the unpowered flight upward and the subsequent fall, both in near-vacuum conditions, the experiments onboard would be experiencing microgravity just like on a satellite. The use of sounding rockets made the experiments much simpler and cheaper than if a satellite had been used, and the equipment could also be retrieved. The most important reason for using sounding rockets, however, was that the TPEs had to be conducted in the ionosphere, the upper layer of the atmosphere were gases are ionized by solar radiation. The idea was to eject a stream of electrons from the rockets into the ionosphere. The negatively charged electron beam would influence the electrically charged atmospheric gases at high altitude, to a distance of 100 meters (330 feet) or more all around. 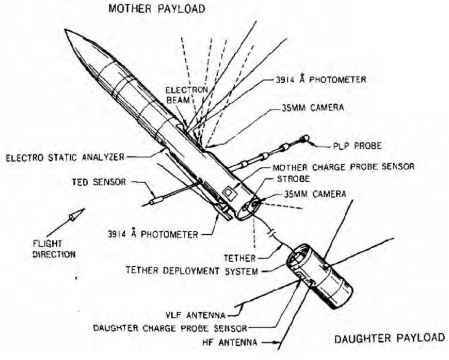 A "daughter" payload connected by a tether to the main "mother" payload would be separated to make measurements inside and outside this charged bubble of gas. As the cable slowly deployed, the conditions at various distances from the origin of the electron beam would be recorded (Fig. 4.4). The TPE-1 mission was launched with a Kappa 9M rocket on January 16, 1980, from the Japanese Kagoshima Space Center. When it reached an altitude of 150 km (93 miles), the electron beam was activated for 16 seconds. Immediately after, the motherdaughter parts of the rocket were separated with a spring system at a velocity of 0.5 meter per second (1.6 feet per second), unrolling the tether while drifting away. The plan had been to deploy 400 meters (1310 feet) of cable, but unfortunately the two rocket elements did not part by more than 38 meters (125 feet). Another disappointment was that the electron beam refused to work after the separation, due to a failure of the payload battery pack. The various passive sensors onboard the rocket nevertheless worked fine and collected a lot of data. The rocket reached a maximum altitude of 328 km (203 miles). feet)—further than before, but still far short of the 400 meters target. Also, the batteries failed once again, so that no active electron beam experiments could be performed after detachment of the daughter payload. The rocket reached an altitude of 322 km (200 miles). Although on both TPE flights the payload parts did not separate as far as intended and the electron beam quit too soon, useful scientific data on the behavior of the ionosphere were obtained nevertheless. In addition, on the second mission the dynamics of the tether deployment had been recorded with a small CCD television camera. The pictures showed that the cable did not remain straight, but coiled up due to its own "springiness" and the lack of sufficient pulling force. A third flight of the experiment was planned by ISAS and Utah State University, this time also involving Stanford University and the University of Michigan, and using an American Black Brant V rocket launched from the White Sands Missile Range in New Mexico. The new mission was named both TPE-3 and CHARGE-1, an acronym for Cooperative High Altitude Rocket Gun Experiment. The tether system for this mission was redesigned to minimize friction during deployment. Moreover, during separation small thrusters installed on the daughter payload would be activated every 40 seconds to generate a pull on the cable. The spring system was set to impart a velocity of 1.5 meters per second (5 feet per second), higher than during the previous two flights. The electrons released by the electron gun system would result in charging of the mother payload with respect to the daughter element. A metal wire was used as tether for this experiment, so that an electric current could flow between the two payloads and be measured. CHARGE-1 was launched on August 8, 1983. At an altitude of 142 km (88 miles) the electron beam was put on, injecting electrons in a well-controlled configuration parallel to Earth's magnetic field lines. At 169 km (105 miles) the two rocket elements separated. As a result of the deployment system improvements, the tether now deployed to its full length of 418 meters (1370 feet). The ejection of electrons did result in a difference in electrical potential between the mother and daughter payload, creating a current flow through the tether. The cable was also found to act as a radio antenna due to this electrical current. However, the battery pack design was still flawed, and once again the electron beam stopped working after separation. The Black Brant reached an altitude of 218 km (136 miles) before falling back down. A mechanism was supposed to cut the wire once the rocket had descended below an altitude of 100 km (62 miles), but due to the strong aerodynamic drag the tether snapped just before the cutter was activated. The experiment was launched again on December 14, 1985, and called CHARGE-2. The cable deployed to a length of 426 meters (1400 feet), the longest distance of all flights up to then. This time the electron gun and the instruments, which measured the characteristics of the plasma and the rise in electric potential of the mother payload with respect to the daughter element, worked perfectly throughout the flight. An onboard camera was also able to observe the trajectory of the electron beam. The reaction control system thrusters on the daughter payload were activated for 3 seconds every 30 seconds. Not only did this result in a pull on the cable, but the released gas was also unexpectedly found to have an effect on the relative electrical charge of the two spacecraft elements. It reduced the electric potential of the mother payload, thereby resulting in an increase in the electrical current flowing from the daughter to the mother element through the conductive tether. The activation of the main reaction control system of the rocket itself was found to have a similar effect. In 1992, CHARGE-2B flew similar equipment to that on CHARGE-2, as well as a separate, free-flying element. A Black Brant V rocket was again used for this flight. The mission was specifically meant to generate electromagnetic waves by modulating the electron beam in the frequency range of very low frequency (VLF) radio waves. Based on the experience with CHARGE-2, a system that slowly released cold gas was built in to prevent too high electrical charges from building up on the mother payload. The tether fully deployed once again to over 400 meters (1300 feet), and the experiments all worked as planned. The flight represented the last launch in the TPE/CHARGE series, but meanwhile two other projects with similar goals had already flown and a third was being planned. On February 8, 1988, the U.S. Air Force Geophysics Laboratory launched the ECHO-7 payload onboard a Terrier-Black Brant V sounding rocket from the Poker Flat Research Range, near Fairbanks in Alaska. The mission was to study how an artificial electron beam propagates along magnetic field lines in space. The payload involved four different elements that were separated at high altitude and continued their flight on their own. One of the elements, called the MAIN payload, involved an electron beam gun and a tethered probe and was similar in concept to the payloads used on the TPE/CHARGE flights. Unfortunately, when the MAIN payload reached an altitude of 292 km (182 miles), close to its apogee, various pieces of onboard equipment failed due to a rapidly increasing electrical potential difference between the two payload elements; large electrical charges and sensitive electronic equipment do not combine very well. Yet another sounding rocket experiment involving tethers was flown on January 30, 1989, onboard a Black Brant X three-stage rocket from the small launch site at And0ya in Norway. The mission was called OEDIPUS, an acronym for the imaginative name Observations of Electric-Field Distribution in the Ionospheric Plasma—A Unique Strategy. OEDIPUS-A was a joint program between the National Research Council of Canada and NASA, with the participation of the Communication Research Center of Ottawa, various Canadian universities, and the U.S. Air Force Phillips Laboratory. 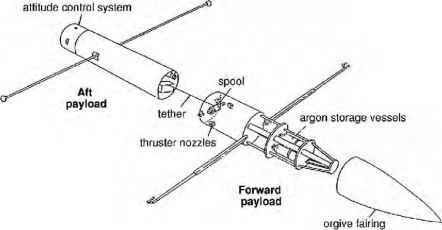 Also during this flight the payload consisted of two elements that separated using a spring and cold gas thruster system but remained connected to each other by a conductive tether. The cable was deployed over 958 meters (3140 feet), establishing a new record for tether length in space, and the rocket reached an altitude of 512 km (318 miles). 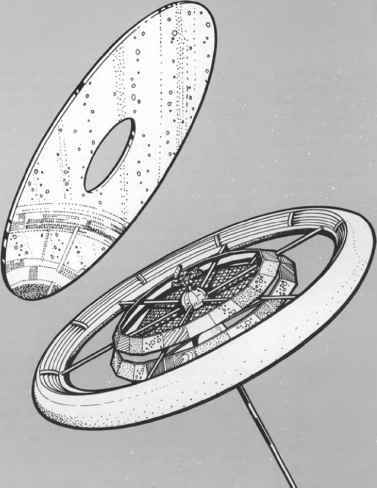 The mission did not involve an electron gun, but only passive measurement instruments to study the ionosphere (Fig. 4.5). The second flight of this experiment, OEDIPUS-C, took place on November 6, 1995, from the Poker Flat Research Range in Alaska using a Black Brant XII rocket. This time the rocket flew up to an altitude of 843 km (524 miles) and deployed 1174 meter (3852 feet) of tether. electron beams and ionospheric plasma, and the charge-mitigating effects of the release of gas. Moreover, important lessons were learned on the deployment of long tethers in vacuum and under microgravity conditions. These valuable experiences formed the basis for the next series of space tether experiments, conducted onboard the Space Shuttle. Space tethers were finally returning to Earth orbit.